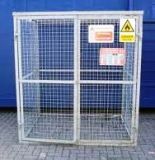 Drainage Superstore is proud to offer a range of gas storage cages in a range of sizes, shapes and materials depending on the application. How should gas be stored? It is important to store gas bottle and cylinders correctly, as when they are stored incorrectly they can cause damage and injury. Gas cylinders should always be stored in dry, safe places on flat surfaces, and importantly there should be good air flow, which is why they are commonly stored outside. They should also never be stored near a heat source. 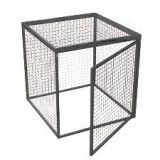 How do gas storage cages help? 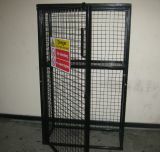 Gas storage cages provide a secure solution to gas storage. 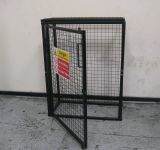 In a range of colours, shapes and sizes depending on the size of gas bottles or cylinders you are looking to store, gas storage cages allow you to store your compressed gas outside, and stop them from being in danger of falling over or being knocked over, which can cause serious damage. 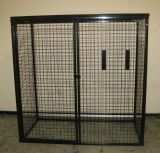 Additionally, you can lock the gas storage cages to keep your gas cylinders safe from theft. Please feel free to browse our extensive range of cage dimensions, from height 900mm by width 1000mm by depth 500mm versions, to height 1800mm by width 2400mm by depth 1800mm specifications. 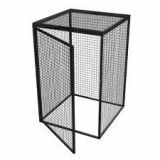 If you have any questions about our products or aren’t sure which one is right for your project, give our friendly customer service team a call on 01752 692221.